Darcy Pattison has written a wonderful and informative story about a spider who went to space. 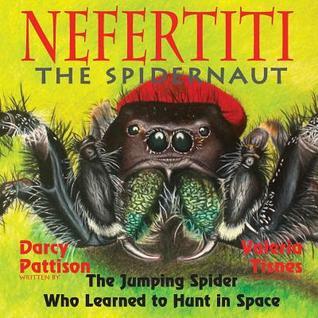 Nefertiti was a Johnson Jumping Spider. She was chosen because she was the largest of her siblings. They wanted to see if she could adapt to zero gravity to hunt in space. They sent along a food supply of fruit flies. She not only learned to hunt in space, but when she returned to Earth, she needed to learn to change her hunting methods. I never realized how smart spiders were until I read this true story. I believe, like all of Darcy’s books, this is another great book that should be in all classrooms. I received a copy to facilitate my review. The opinions expressed here are my own.